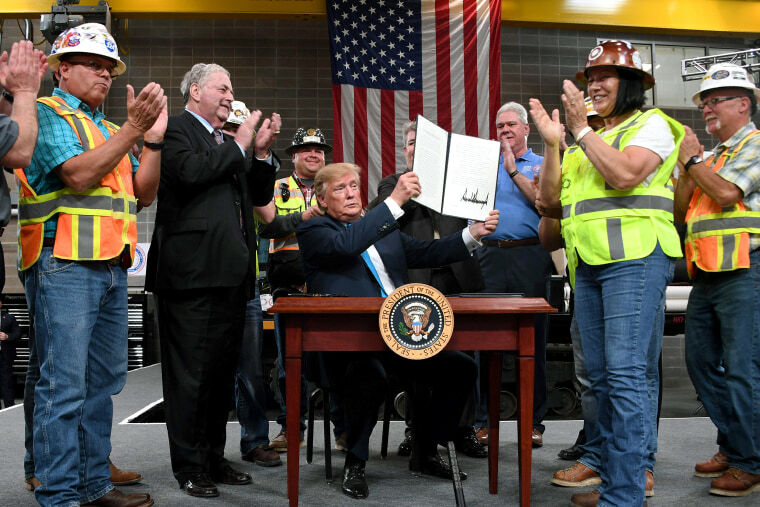 President Donald Trump signed two executive orders on Wednesday that he says will accelerate the approval of energy infrastructure projects in the United States. Trump signed the executive orders before applauding union workers at a training facility in Crosby, Texas. The president energy infrastructure is too often held back by special interest groups and others. He particularly took aim at the state of New York, saying "obstruction" on a gas pipeline "does not just hurt families and workers like you, it undermines our independence and national security." Trump is trying to make it harder for states to block pipelines and other energy projects due to environmental concerns. Trump will order the Environmental Protection Agency to issue new guidance that states will have to follow to comply with the Clean Water Act. The second executive order will streamline the process for infrastructure projects that cross international borders. The move follows Trump's decision to issue a new permit for the Keystone XL oil pipeline. Trump also heaped praise on Texas Land Commissioner George P. Bush, saying he's the "only Bush that likes me." Bush was in the crowd in Crosby and Trump called out: "Where's George? Come here, George. This is the only Bush that likes me." Workers in the crowd laughed and shouted in approval for the oldest child of former Florida Governor Jeb Bush. Bush walked up on stage, shook Trump's hand and the two exchanged a few words. Trump called him a great guy, introduced him as the "Bush that got it right," and said he was going to go far in life.